Whether at work or on the couch enjoying your favorite show, it is hard for even a few minutes to go without hearing something about the cloud. It’s here, we get it and by in large we like it; at least what we know about it. However, for the average small business owner, they are still trying to figure out what the cloud means to them. Surely they are using the cloud in some capacity. Perhaps for their storage, backup or maybe just for some consumer purposes like media (music) management and file sharing. Nevertheless, cloud is here to stay. For business leaders, especially the small and midsize kind, the implications of cloud computing are much larger. The arrival of cloud means so much more than just a new way to store your music or manage your documents. In fact, I would argue that cloud is the ultimate play for helping small companies not only grow, but get off of the ground fast without sacrificing the important systems required to run a business. 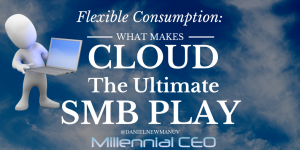 So what is it exactly that makes cloud such a smart play for the small and midsize company? While there are many things that attribute to how the cloud can help any business big or small, the biggest competitive advantage of cloud can be found in these 3 areas, which make up the concept of Flexible consumption. Rapid Scale: In today’s fast paced world businesses can grow (and contract) at a breakneck pace. What starts as a couple of employees in a basement can turn into 100 employees in an office building in a matter of months! Before the cloud, this could create a lot of strain on a business from both a hardware and a software standpoint. Today, companies can expand their platforms, users and capabilities with just a few clicks of a mouse allowing businesses to concentrate on growing rather than deploying more costly (and rapidly depreciating) computing assets. Usable Data: Many cloud solutions from both a hardware and software standpoint provide remarkable metrics that can be utilized to make better business decisions. Serving as a great example of the application of big data, a company can quickly parse out their use data of just about any cloud-based service they deploy. So rather than guessing as to what services are being used or needed, the data will give specific information that can help guide decision making. The cloud is now even being used to take the data to predict future use (predictive analytics), which will help businesses utilizing the cloud to make better business decisions. Cost Predictability: Because most cloud deployments (PaaS, IaaS, and SaaS) run as a service as opposed to having large fixed (Capex) costs, the cloud provides great accuracy in understanding your computing costs. When businesses grew in the past it was often difficult to estimate the cost of scaling computing resources to support more production or more employees. Now it is easy to know exactly what the costs of growth will be, once again helping small businesses wrap their arms around the benefits of growth, as well as the potentially savings associated with an unexpected reduction. In the past accessibility to technology was an absolute killer (Especially for small companies). Even if your business had nothing to do with technology, the cost of technology could be a roadblock for both getting started and growing to your potential. Today’s technologies run in the cloud and this empowers small and medium businesses. From CRM to ERP to your communication platform, cloud is driving the more flexible, intelligent business. The future of the SMB will ride on the power of the cloud, and of all the beauty that cloud creates. Yet, deep down the clouds most striking feature may truly be found in its flexibility.